NAIROBI, Jul 25 2011 (IPS) - For the first time ever, the Kenyan finance minister has allocated almost four million dollars, about 3.6 percent of the primary education budget, to provide free sanitary pads to schoolgirls. This comes after persistent pressure from women parliamentarians who took the issue of girls’ absenteeism from school, due to lack of sanitary pads, to parliament. It was a campaign that left their male counterparts speechless, for such matters are rarely spoken about in public, let alone in parliament, in Kenya’s conservative society. In their persistent lobbying, the women parliamentarians brought to the fore a problem that could have continued to hinder the education of young girls. Thirteen-year-old Dorothy Akinyi, a standard seven pupil from Kibera, which is arguably the largest slum in Africa, stays at home every time she menstruates. 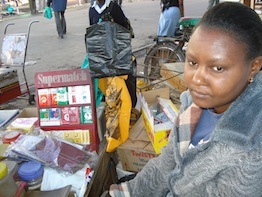 “Without sanitary pads life at school is difficult. We are subjected to very embarrassing and humiliating incidents, especially from the boys. Tying a pullover around your waist to hide the soiled patch behind your uniform in case the tissue leaks is a dead giveaway. We choose to stay at home,” explains Akinyi. But the situation is bound to change for Akinyi and other girls like her – although only if the money allocated for the sanitary wear is spent efficiently. If the funds are used effectively they will help ease the situation, but the money is still not sufficient to provide sanitary wear for all girls in need, and there are calls for partnerships with the private sector. “This is gender responsive budgeting at work. Being sensitive to the distinctive needs of men and women, while allocating and spending public funds,” explains Jacinta Nyachae, executive director of Kenya Aids Law Project and an advocate of human rights. Her comments come just as Rwanda prepares to host a global high level meeting on increasing accountability and developing effectiveness through gender responsive budgeting in Kigali from 26 to 28 Jul. The meeting is held in conjunction with the United Nations Entity for Gender Equality and the Empowerment of Women and the European Union. But girls are not the only ones to have benefitted from a gender sensitive strategy. In a move that has seen women break down socio-political economic barriers, the planning and budgeting for the establishment of the ministry of gender and children affairs remains government’s strongest show of its commitment to address gender inequality. “But gender planning and budgeting is not enough, the rampant corruption across various government ministries is a clear indication that there’s need for tracking and monitoring how these funds are used,” explains a source from the G-10 alliance, which is a coalition of women organisations fighting for women’s rights. The Women Enterprise Fund (WEF) was set up by government in December 2006, as a gender responsive strategic move towards addressing poverty through the socio-economic empowerment of women by creating an avenue for them to access microfinance credit previously out of reach of marginalised women. Treasury allocates about 24,000 dollars to each of the country’s 210 constituencies for women to access in the form of loans. Corruption is an issue that Kenya is struggling to deal with. At the moment, 31 civil society activists have been remanded in a Nairobi cell after being arrested Jul. 18 during a long-drawn vigil to have the minister of education, Professor Sam Ongeri, resign over massive corruption allegations. Several other ministries have also been implicated in corruption, which is a clear indication that gender planning and consequent budgeting are not enough. There is a need for checks and balances to ensure that the public funds are used for the projects they were intended for. Although the issue of transparency and accountability is yet to be mainstreamed alongside the gender mainstreaming process, various attempts to lift the plight of women have been partially successful. While the Women Enterprise Fund has been accused of not reaching all the women who need the money, it has made a difference to the lives of many. “The establishment of the Women Enterprise Fund to enable women to access macro finance has seen women in the informal sector become economically empowered,” explains Dr. Wilfred Subbo, a university lecturer on Gender and Development in Nairobi. “This is important because poverty is gendered. Men and women experience poverty in very different ways. Research has shown that there are more women living in poverty than men because more women are illiterate, thus limiting their chances of exploiting employment opportunities that can afford them (a) decent living,” he adds. He says structures were needed to audit the money as it was being spent, and not after, in order to immediately deal with any financial inconsistencies. “How do we know for sure that the four million dollars currently allocated to the Women Enterprise Fund will reach the economically marginalised women it is intended for?” he asks. The national budget is an opportunity for the government to show its commitment in raising and spending resources. “Gender budgeting response doesn’t mean that the treasury develops two budgets, one for women, and the other for men. It means that the government shows an awareness of the fact that some problems are (particular) to men and others to women,” Nyachae expounds. She was referring to the current national budget allocation of about two million dollars or 0.2 percent of the health budget for the improvement of testing for and treatment for cervical and breast cancer. It was also the first time the ministry of finance had made such an allocation. “Cervical cancer continues to be a leading killer disease even though it is the most preventable and treatable form of cancer. Statistics from Kenyatta Hospital show that at least 2,000 new cancer cases are diagnosed every year with a similar number dying from the disease annually,” explains Dr. Brigid Monda, a gynaecologist and lecturer in Nairobi. Kenya has a population of 10.32 million women aged 15 years and older who are at risk of developing cervical cancer. Current estimates indicate that every year 2,454 women are diagnosed with cervical cancer and 1,676 die from the disease. Cervical cancer ranks as the second-most frequent cancer among women in Kenya according to the World Health Organization Information Centre on Human Papilloma Virus (HPV) and Cervical Cancer. Gender responsive budgeting is a reflection of gender sensitive planning and practical solutions towards ensuring that gender inequalities in all facets of society are addressed. “Integration of all into the mainstream development process is in itself a realisation of the objective to achieve sustainable development. It is also a means to bridge the development gap between men and women. It can also create transparency and accountability because women have been found to be efficient and effective implementers of public funds and resources,” Subbo says.